Craniosynostosis is the premature closure of the open areas between the skull growth plates, often termed sutures, in an infant. When there is no other involvement besides the skull growth plates, the condition is termed non-syndromic craniosynostosis. There can be some genetic predisposition to craniosynostosis, but most often it occurs spontaneously and is thought to be the result of in-utero growth constraint. Examples of this include small pelvis, low amniotic fluid, larger-than-normal babies, and twins. When a suture closes prematurely, an abnormality of head shape occurs due to compensatory expansion required by the growing brain. This compensatory growth causes predictable skull deformations that are most often diagnosed clinically, but a CT scan may be obtained to verify the diagnosis. There are six major skull sutures, two of which, the coronal and lambdoid, are paired. The two most common causes for premature closure of a suture are either a change in one of the child’s genes, or from pressure on the skull. When only a single suture is fused shut, the most common cause is likely to be from outside pressure on the skull. 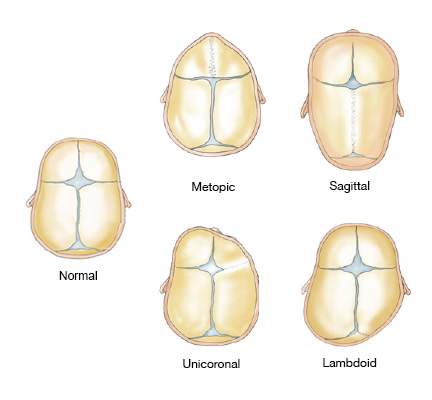 It is possible to cause craniosynostosis in animals by restricting skull growth while the animal is still in the womb, and it is very likely that this is the primary cause for the majority of the single sutural synostoses in babies. The uterus is a relatively small space. It is known that sometimes babies can end up in certain positions in the uterus where they cannot move around freely (for example, the breech position). It is suspected that children born with a single sutural synostosis may have arisen from abnormal position in the uterus resulting in pressure on a part of the skull. If the skull gets caught in a tight place in the uterus, this pressure can restrict the ability of the skull bones to be stretched apart by the growing brain. Abnormal skull shapes and single suture synostoses are more commonly seen in twins than in single births, further supporting this theory of in-utero constraint. Surgery to correct craniosynostosis can be done at any age. The ideal time is between 4–10 months, depending on which suture is fused shut.However, when using endoscopic, or minimal invasive surgical approaches to craniosynostosis of any type, the operation is best done very early, between 2-4 months of age. The goal of the operation is to remove the obstructive fused skull bone early and then remodel the post-operative immature remaining skull bones, through an orthotic banding device, or helmet. Helmet therapy is variable in duration depending on severity of the deformity, ranging from 3-12 months, and beginning 1-3 weeks after surgery. Endoscopic approaches are commonly used for sagittal synostosis with excellent results. It can be used in other types of fusions, but patient selection and scale of the deformity are critical in deciding when to use this approach versus open techniques. However, it is being employed more often and with success in metopic and lambdoid fusions. We continue to push the bar of less invasive techniques for surgery. The goal, however, is an excellent result and therefore patient’s age, type of fusion and severity all weigh into deciding which approach is best. The incidence of trigonocephaly is approximately one in 3,500 births. Some children may be very mildly affected and do not require treatment. There is a term being used currently that may be misleading called mild or moderate trigoncephaly. This is confusing, as most children fuse this growth plate normally around one year of age. This time frame is variable and therefore, a child may close their suture at 8 or 9 months and be considered normal but have some mild features of an early fusion. A fusion is nearly always an in-utero event and therefore, picked up earlier because of the constraints placed on the developing skull. Trigonocephaly has also been reported to occur when mothers have taken Valproic Acid for seizures.